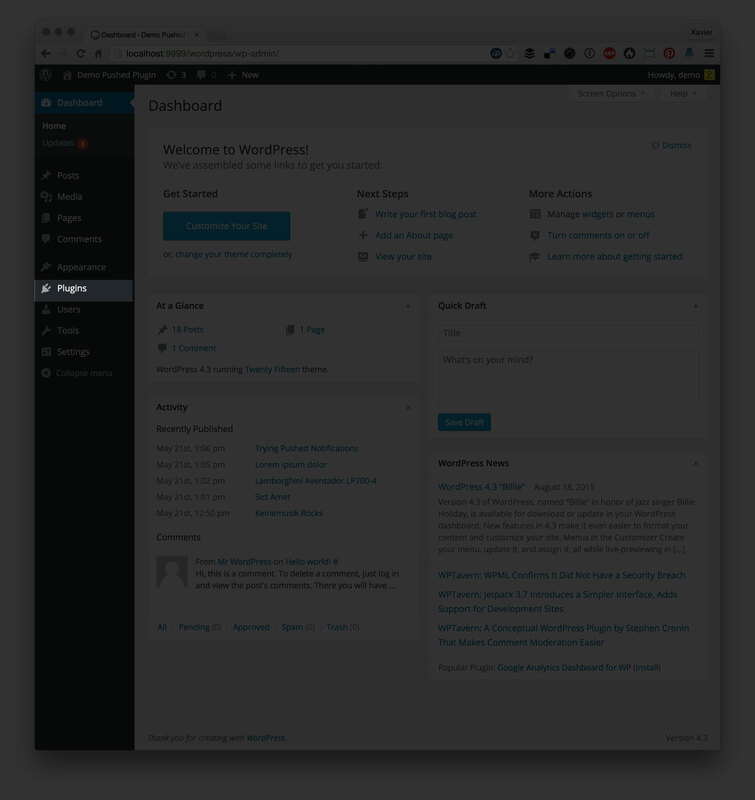 Open your Wordpress Admin area and go to Plugins (you will find the option in the left navigation menu). In the plugins page, click on Add New button (on the top, just right after the Plugins text title). Search for Pushed in the Add Plugins page. Look for Pushed and click on Install Now. Once the plugin is downloaded click on Activate Plugin. Once the plugin has been successfully activated, it will be listed on your Plugins section. Click on Settings in order to introduce your Pushed credentials. Source: App or Channel, whether your Pushes source is an app or a channel. Pushed Source Alias: the alias of your app or channel. Pushed App Key: the key of your app or channel. Pushed App Secret: the secret of your app or channel. Once you enter the credentials, a new section will be visible in your Posts edit area (at the right navigation bar). That’s all! Now your subscribers will receive a push notification on the Pushed app every time you publish a new post. If you would like to force to send a push notification when the post is updated, mark the checkbox option "Send a push notification when the post is updated". Remember that for them to receive your notifications must have installed Pushed (mobile or desktop version) and subscribed to your app or channel. Please report any bugs or feature requests on our Support page.